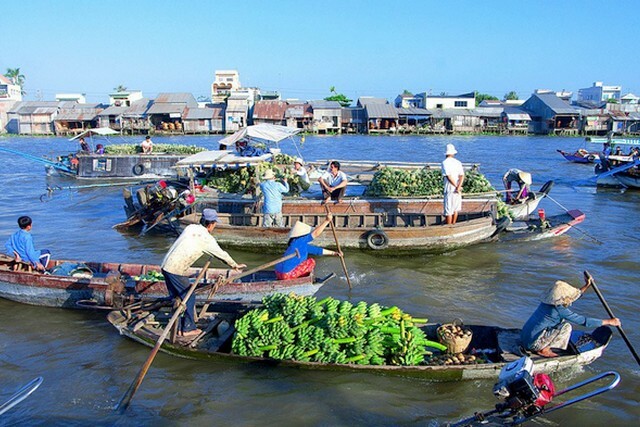 Slurping a bowl of rice noodle soup, Vietnamese crab and tomato soup or savoring a piece of cake wrapped in coconut leaves with a cup of Vietnamese coffee on a boat in the middle of the vast river would definitely be an unforgettable experience. There are various choices for tourists. 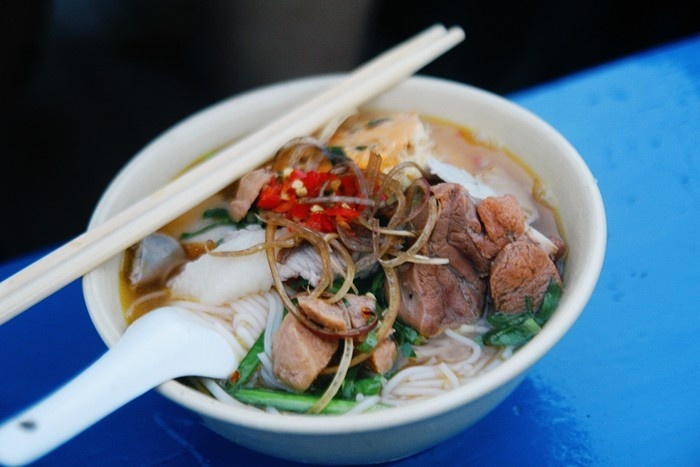 However, “hu tieu” or rice noodle soup is somehow the most tasty and not so exotic for foreigners to taste. With only rice noodles with few slices of pork (and maybe one or two pork bones), bean sprouts and chopped green onion, you still have a delicious breakfast. The feeling of holding a bowl of rice noodle soup and eating on a shaking boat whenever another larger boats passing by is somehow challenging but definitely makes you excited. “Bun rieu cua” or Crab and tomato noodle soup is one of the dish that leaves an indelible impression for many eaters with the typical shrimp pasty. If you can bear the smell of shrimp pasty, you should at least try it once, you will not regret. A crab noodle with an eye-catching red color of tomatoes, green onion, and typical fragrant shrimp pasty and a bit spicy of chili is honestly great to enjoy. “Bun thit nuong” or Vietnamese grilled pork and rice noodles on Cai Rang market is much simpler than the true Vietnamese grilled pork and rice noodles. With only cold rice vermicelli noodles, few slices of grilled pork and vegetable without spring rolls are contained in a foam food box. Pork are sliced into smaller pieces, marinated in spices for tasting and slightly grilled at first. Seller grill pork again before selling it to you so that you can enjoy while pork are still hot. The pork is perfectly tender and has a pleasant smell. Preparing and processing food on the boat is quite tricky. Just one carelessness will make the food shed. Hence, it is required a high caution and skillful experience in every stage. And yet, the locals here still do it as normal and without any difficulties. You would be amazed with their fast movements like nothing can concern them to prepare a perfect dish for customers. A hot and delicious bowl of noodle is circulated fast like that to customers. “Chao long” or Pork Organ Congee is another dish you should try once. A bowl of porridge on the boat is not exact as in a normal store. 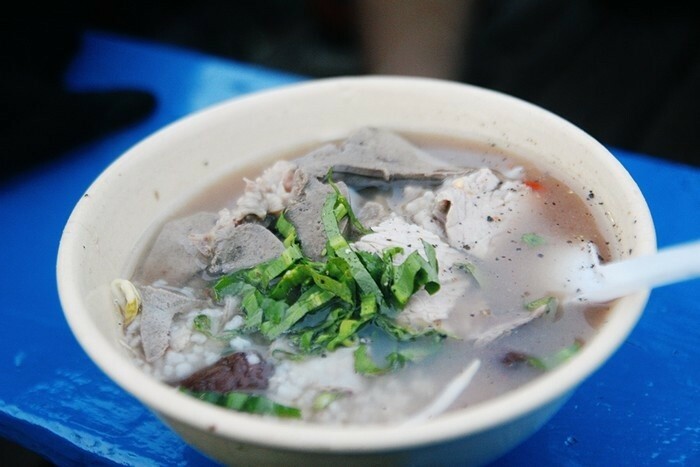 With few slices of pork meat, pork liver and blood cubes added up with few bean sprouts and finely chopped green onion still highly satisfy any eaters. Visiting Vietnam, you definitely cannot miss a chance to taste the famous “Banh mi”. “Banh mi thit” is also easy to find among those “mobile shops”. Just shout out loud “Chi oi!” towards the seller, you will have a fragrant and crispy “Banh mi” right after that. The breakfast on Cai Rang market is simple and rustic but it still remains the soul of Vietnamese cuisine over hundred years. There, you will not can only enjoy the tasty and unforgettable flavor of many dishes, but also observe the entire familiar daily activities without ornament of the locals. A peaceful and homey image that would make anyone wish to come back here again.